THE MARTINI CHRONICLES: Martini Thursday...Blackberry Pomegranate Martini!!! Greetings Divas and Gents! I've been super busy this week, as I have been away in D.C. at a conference for work. I did remember, however, that today is Martini Thursday! As such, please join me in welcoming the Blackberry Pomegranate Martini to the Martini Chronicles. This recipe was inspired by a martini of the same name that is showcased at The Market Restaurant and Bar in Harding Township, New Jersey. I couldn't wait to share the recipe with you! You will tell me if you like it, won't you? Perfect! 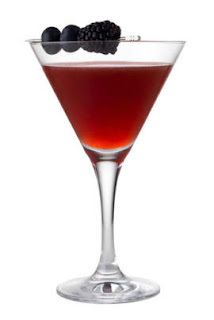 So, please enjoy the Blackberry Pomegranate Martini, and have a great weekend! 1. In a martini shaker, muddle non-frozen blackberries for about a minute. 2. Add citrus vodka, pomegranate juice, triple sec, sour mix and ice to shaker. Shake! 3. Drop a few frozen blackberries into a chilled martini glass. 4. Strain mixture into martini glass. What do you think? Please be sure to let me know in the comments section below. Again, have a great weekend! And Drink Responsibly!